00:45:00 Makes 4 servings, 1-1/2 cups (375 mL) each. Makes 4 servings, 1-1/2 cups (375 mL) each. We love having a warm, cheesy pasta casserole on the table, and four kinds of cheese make this one extra special. 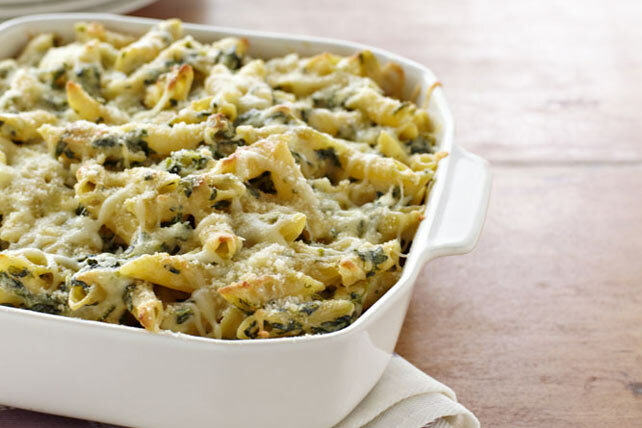 It's one step up from mac and cheese, but our Four-Cheese Pasta Florentine pasta recipe is just as easy to make. Cook macaroni as directed on package. Meanwhile, cook spinach as directed on package; drain well. Place in large bowl. Add cream cheese; stir until melted. Stir in cottage cheese and eggs until well blended. Drain macaroni. Add to spinach mixture with mozzarella; mix lightly. Spoon into 8- or 9-inch square baking dish; top with Parmesan. Bake 25 min. or until centre is set. Serving Size Makes 4 servings, 1-1/2 cups (375 mL) each.